It’s become a predictably heart-wrenching tradition … people gathering at Ground Zero in New York City to remember the 2,983 people who perished during the 9/11 attack. There was a moment of silence at 8:46 AM ET to mark the time the first plane hit the North Tower. Two minutes later names of the people who died were read. Just 2 days ago, the Cortlandt Street subway station, which used to be under the World Trade Center, was re-opened. The terminal was destroyed when the Towers collapsed. Donald Trump chose Pennsylvania as the place to memorialize 9/11. 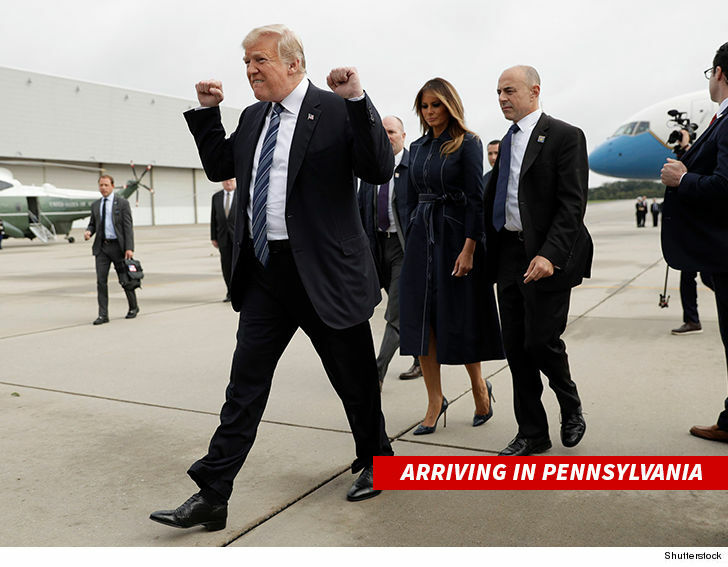 He and Melania flew from D.C. to Shanksville, where a memorial was constructed where Flight 93 crashed after passengers rushed the cabin and attempted to take the plane. Trump tweeted, “17 years since September 11th!” He also praised Rudy Giuliani, who was Mayor in 2001 and is now Trump’s lawyer and mouthpiece, for the job he did in NYC after the attack. Vice President Pence stayed in Washington and visited the Pentagon, where one of the hijacked planes crashed.